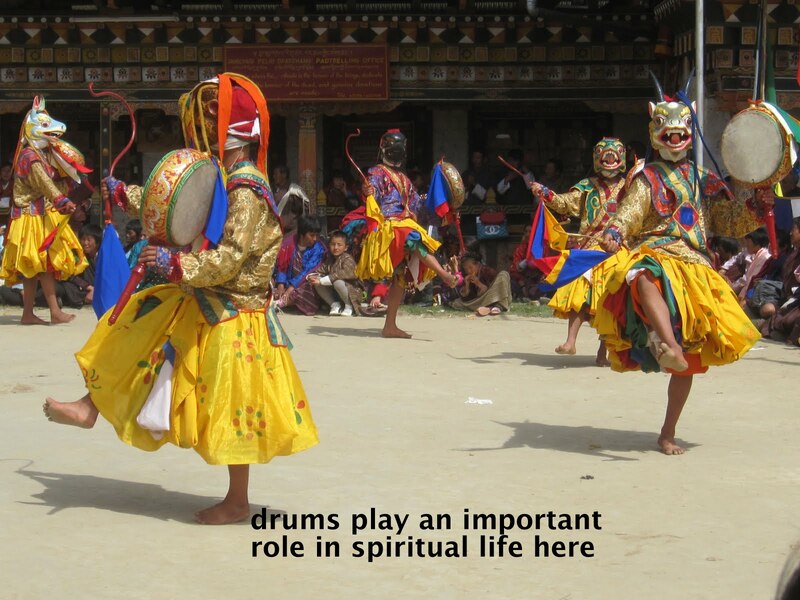 How spiritual is your life? There must be so many ways to measure one’s spirituality, though the thought itself sounds pretty crass. Nonetheless, the thought has occurred to me, coming as I am from the West Coast of Canada, which in cultural terms still seems like the New Frontier. The First Nations are about the only people there who can claim more than third generation status. Enter Bhutan and you’re thrown into traditions and culture that seem so established it’s hard to see them changing with the times. 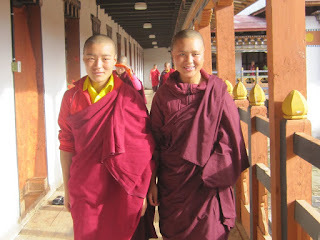 And on top of that, Tara and I land in Bumthang, the spiritual heartland of this country. 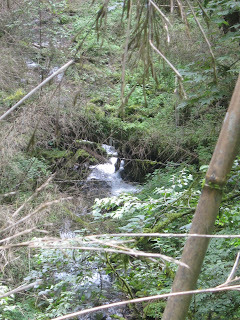 I want to share some recent experiences that are simply part of life here: but few pics, can’t take photos of spirits…. 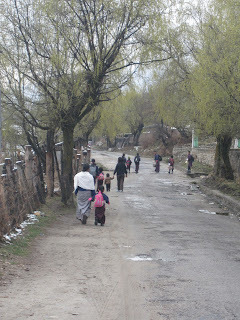 I’ve gone off to the mountain pass between us and the next valley with Karma, our landlord, and his family to cut firewood for the winter. Having stopped to pick up 2-cycle oil to mix with the petrol in a couple of empty water bottles, we park on the side of the switchback road (of course, what other type of road is there? ), and I operate the chainsaw I’ve just repaired. The saw runs with this mix for about 20 minutes, then stops. We argue about why it stops, and hack away with axes enough to fill up the back of the truck. 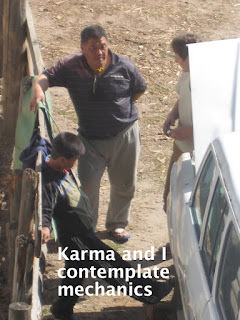 He jokes that it looks bad for the passing cars to see a ‘Chillip’ like me working with Bhutanese standing watching: it’s supposed to be the other way around. Then he says that it doesn’t "feel right" where we are working, and that the saw will work better at home. We don’t solve the problem, and I insist that we have the wrong oil/petrol mix. But Karma gets the saw going again at home, so we agree to disagree. Now the next day is Vishwakarma Day, a Hindu holiday whose precepts are adopted by many Bhutanese. Cars, trucks and tractors are festooned with balloons and blessed white scarves, and the trades people have set up altars at work. Music blares from the construction sites and sawmills, as they dedicate their celebrations to the God responsible for maintaining safety at work and smooth running machinery and tools. I laugh at the perfect timing, hoping our chainsaw is taking this all in. Karma continues to insist that whatever was stopping the saw is ‘fixed’; that the saw will probably work now. While Tara’s away on her India adventure, I’ve been checking in on our little friend with a sore leg, Sonam. This high school student has been in bed for more than a month now. She started with a fever and strange-feeling head, but now it is pain around her right femur. Like all locals, she is incredibly stoic, peacefully answering my questions while writhing in pain. She lives 24/7 in a bed in the altar room of her family's small 3-room bamboo hut. This is typical of families who set up on someone’s land for a short term, such as a year’s work contract or a building project. Surrounding Sonam are various small bowls of food offerings placed around the room. This teenager lies here with only a mug and an occasional school text for company while her family come and go around her. I keep insisting they take Sonam to the hospital, and she smiles and placates me for another week. I find this frustrating and urge a teacher friend to convey my concerns more pointedly. Finally her sister-in-law explains through a friend in translation that the astrologer they have consulted has told them not to not use any modern medicine until this ‘process’ is complete. I argue about my theories of bone cysts, deep tissue damage, blood clots, etc., and even go to the hospital to arrange an X-ray, but no one in the family will take her. Finally, the waiting comes to an end. I’m invited at lunch time to go down to visit. I leave my shoes at the entrance and stoop to enter, but there’s already a lineup of people filling the small altar room, which serves as the living room of their home. A young monk dressed in maroon beats endlessly on a drum. In the centre is a small elderly man dressed like a monk but it many colours. He is spinning around, shouting wildly, spitting his words into the air as he tosses rice in all directions. His eyes are rolled back in his head and his whole body shakes. His attendants offer him various objects from their ceremonial bowls: rice, chana (chickpea) flour, chana dough, water, milk. He babbles and shouts, taking some items, pushing away others. 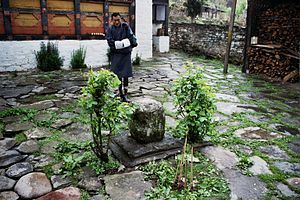 This is the Pao, the shaman, and his job is to remove the evil spirits from Sonam, taking them into his body to exorcise them. His patient has been moved into her adjacent bedroom, and he backs himself into her space, making a small altar in the doorway: an attendant places a small table on the floor, covered with yellow silk. The Pao sprinkles chana, then scribes some figures in the flour with a ceremonial dagger. He then grabs dough and makes a tower. Other sculptures are added, each being created as he passes his hands in front of Sonam’s forehead. Next her brother is summoned, carrying a small brass bowl. The shaman fills it with milk, passes it by Sonam, and then directs it to be sprinkled away outside. Sonam’s brother repeats this several times, tossing the milk in three compass directions, then finally over the roof of the hut. I have to go back to school at this point, but the ceremony goes on. I don’t know what I think about the last half hour, and no one is asking me. I am stunned. All I can think of doing is to turn to the brother, thank him for allowing me in, and offer some bills to help pay for the Pao’s visit. 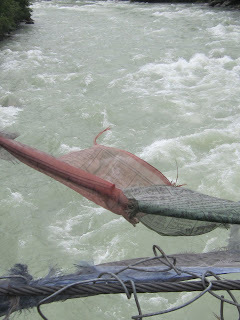 The next day I’m told that the day before the visit, a whole ‘flask’ of pus had been drained from a hole in Sonam’s leg. Today she is feeling better, still walks with a limp, but is back at school. Go figure…. The following day in this same week, an afternoon holiday from school is suddenly announced. This will give staff and students enough time to cross the river and attend the Blessing offered at one of the Lakhangs in the area. I come home, have some dinner, then walk up the valley with a headlamp. 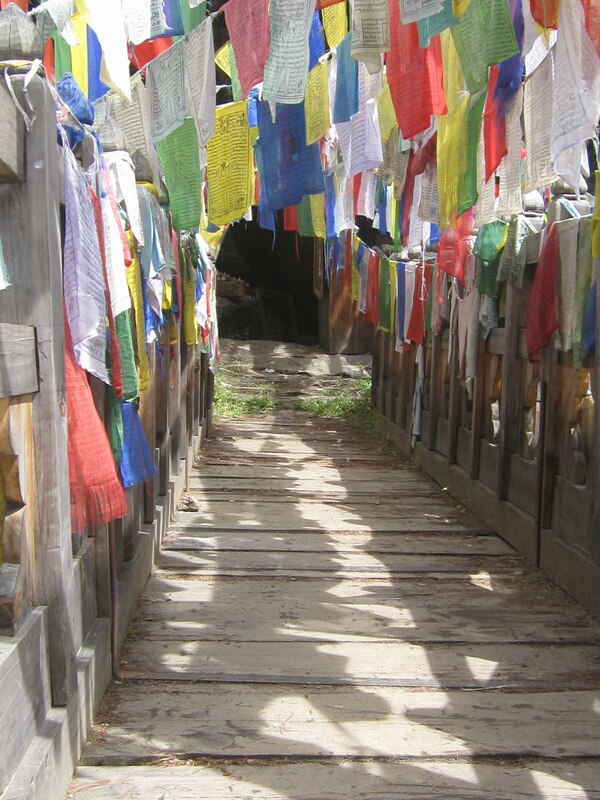 When I start to cross the next suspension bridge, I see ahead of me the glow of other lights in a procession coming out of the tunnel of prayer flags, then up the side of the hill on the other bank of the river. 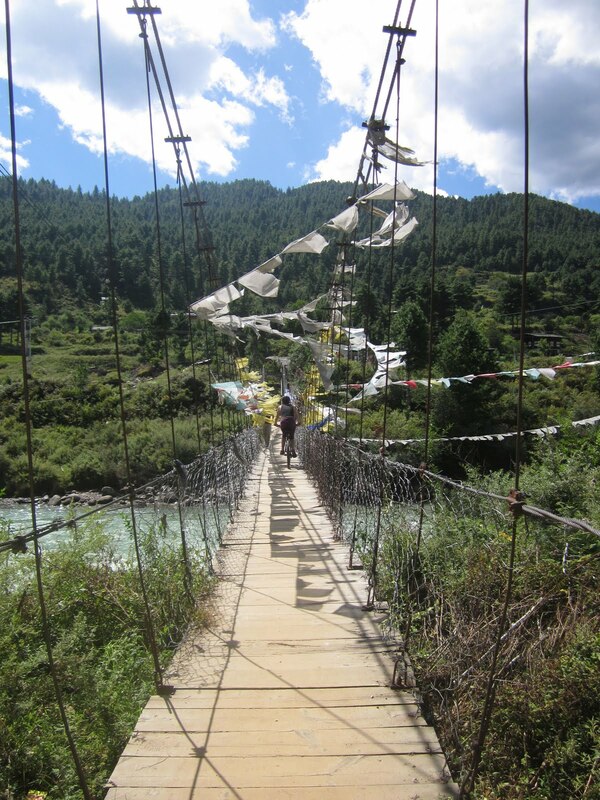 Now in Bhutan you often can’t really see much of the guy wires and superstructure of bridges, no matter how remote. They’re hidden behind streams of flapping prayer flags. 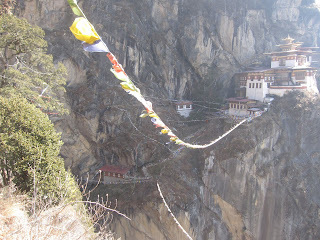 The purpose for this is that the wind that tunnels along valleys, sweeps up mountainsides, and passes over tall buildings and monuments will carry the prayers out to the surrounding air, purifying it. So those prayer flags people coveted in Western bedrooms and living rooms are not fulfilling their purpose: to set their Buddhist Mantras free to the universe. 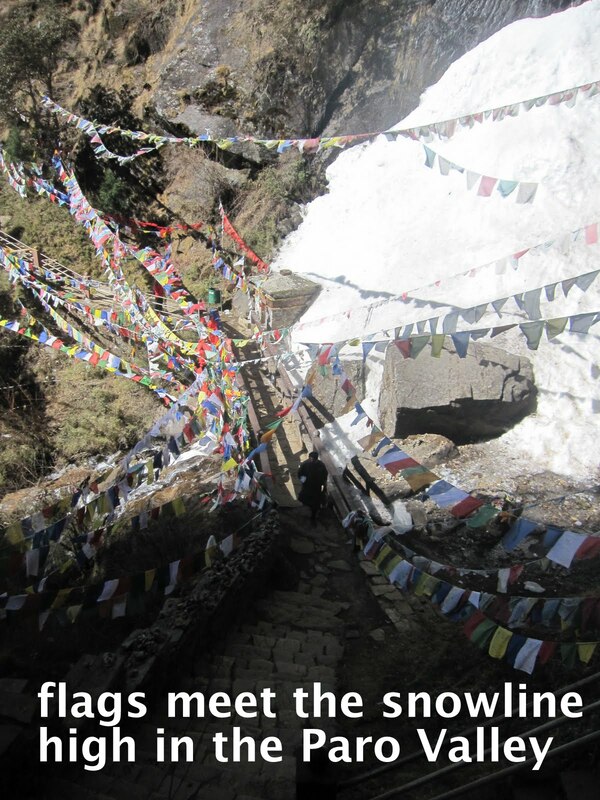 The block-printed cotton flags come in the colours of the five elements, and as they fade to white, are usually left there to return to the elements. Others are continually added, so these bridges always to be moving in the night breezes to hosts of quivering ghosts. I follow the procession into the night along a path for another twenty minutes, towards the glow of firelight coming out of a smoky haze, a white cloud in the dark. 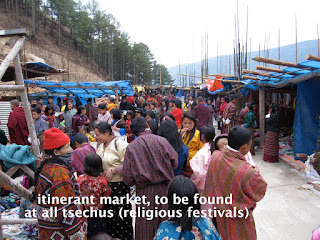 When I arrive at the Lakhang, it is surrounded by blue and orange tarpaulined structures: this is the travelling market, a collection of 30 stalls that appears at any religious celebration lasting for more than a day. The incongruity of it all takes something to get used to: the stalls are selling cheap imported clothing, plastic toys from China, household items like mug with cryptic English sayings on them, or perhaps they house a betting game designed for throwing darts at a number boards…all this is going on in the courtyard of the Tamshing Monastery, built in 1501 by the sacred treasure-seeker Pema Lingpa himself. After a beer and a serving of liver with chillies at one of the snack stalls, I follow a beating drum out into the night again. The locals have formed a huge procession, led by two monks holding flaming torches over their heads. We follow them along the winding dirt road to a field with a 4 metre archway erected in the centre, covered in dry cedar boughs. I think we have now technically gone from a throng to a horde. And this horde is suddenly rushing towards this archway! The monks put their torches to the base, and the whole archway bursts into flames. The crowd presses forward, but no one moves independently now, for fear of being trampled. We run on as a serpentine mass, rushing beneath this roaring inferno. "Dance...is the living tradition of their founding identity and the means by which Pema Lingpa sought to teach the world Buddhism - and the treasure he specifically left the Tamshing monks. 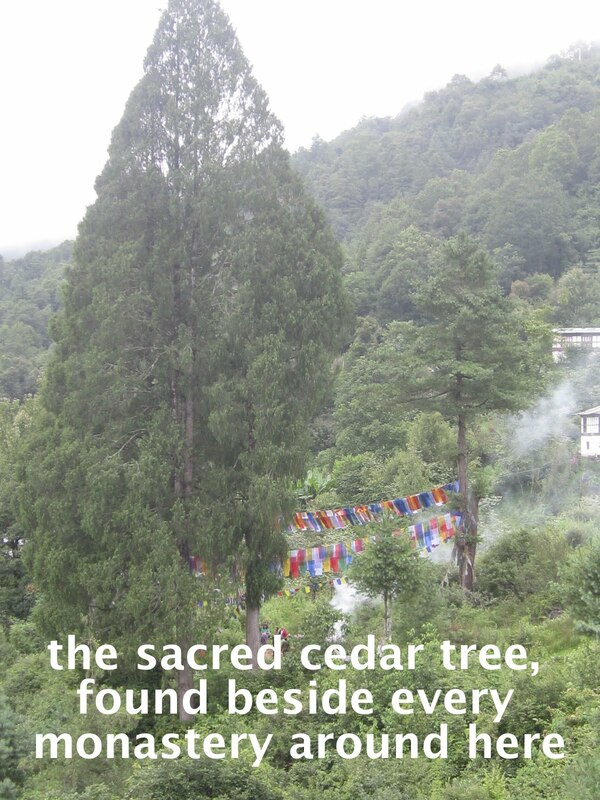 It is the life of the order, the Buddhist truth they maintain. That is one reason we have focused on Tamshing: their dances were revealed by the most famous Bhutanese saint, and Tamshing alone performs the dances correctly..."
This post is dedicated to the ever-loving memory of our friend and colleague, Martha Ham. 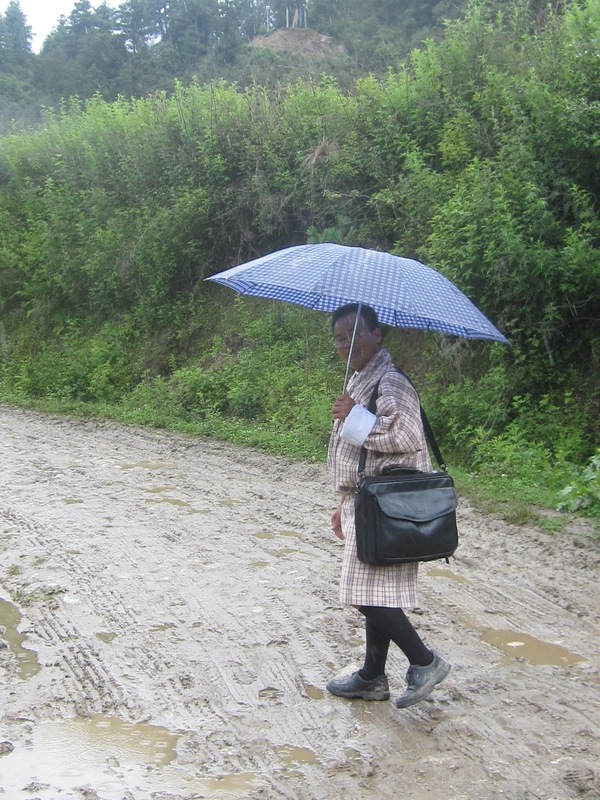 Martha died Thursday afternoon in Mongar Hospital, after fighting extensive infections which resulted in septicemia. Her family in Canada consented to a traditional Bhutanese cremation, which brought friends, students, and associates together to witness an honouring sendoff to a woman who approached life face-first. Among her gifts and accomplishments, Martha was a world traveller, a teacher, and an inspiration to those who love playing with language! 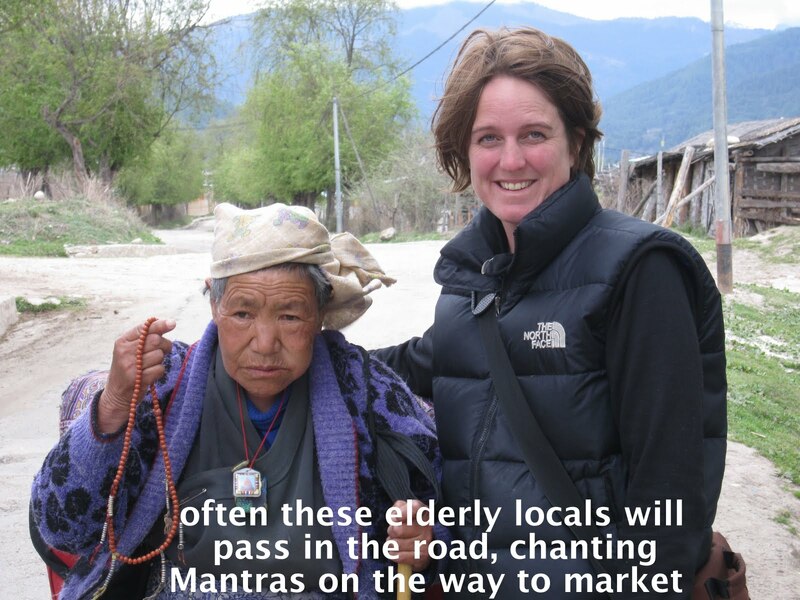 We BCFers are working on a glossary of 'Marthaisms', but in the meantime, I'd like to offer this collection of Dzonglish and Bhutanese English in memory of Martha. This picture was taken during our BCF teachers’ retreat, on July 3rd, 2012. We were in the Bumthang District, visiting a sacred place called Membarthso. This is a beautiful spot where the Tang River channels through a hole in the rock , forming deep, swirling pools. This is where Pema Lingpa, the sacred treasure revealer, plunged back into the treacherous current with a butter lamp to prove that his powers would prevent the flame from going out. On this day Martha sat on a rock here above that spot, contemplating the deep secrets of her surroundings. A. 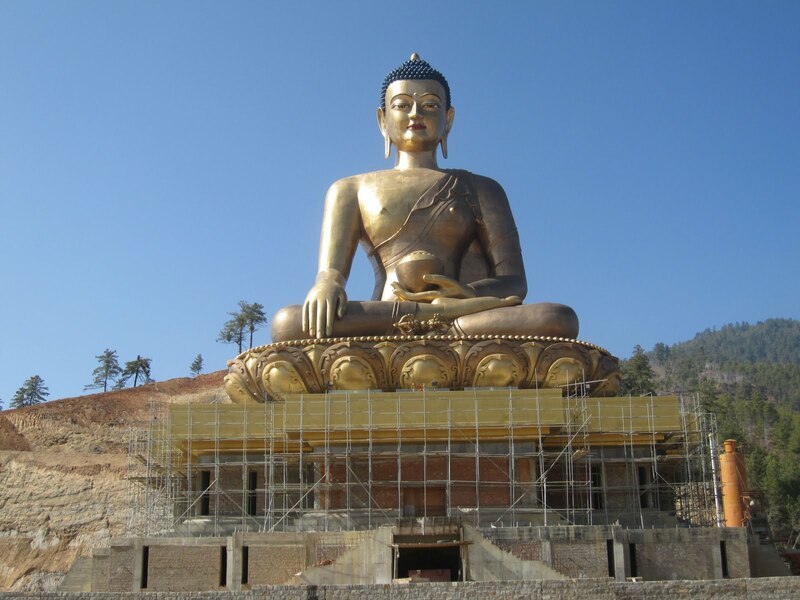 First, here’s a glossary of Bhutanese English, bound to be helpful for those native English speakers travelling to Bhutan who will discover they perhaps don’t really know their own language after all. Brits, Kiwis, and Aussies will recognize many, but don't assume the same meaning for all of them. knife = if it’s not in the kitchen, then we’re talking about a narrow-bladed machete used for trimming cane, chopping meat, cutting firewood, gardening, anything! C. And now, a Pronunciation guide to help you decipher Dzonglish. box : reddish, bushy-tailed dog-like omnivore, smaller than a wolf "fox"
you get to the “b”, stop before you actually pronounce it. Sort of like a shortened, windy poop, but not as dangerous. 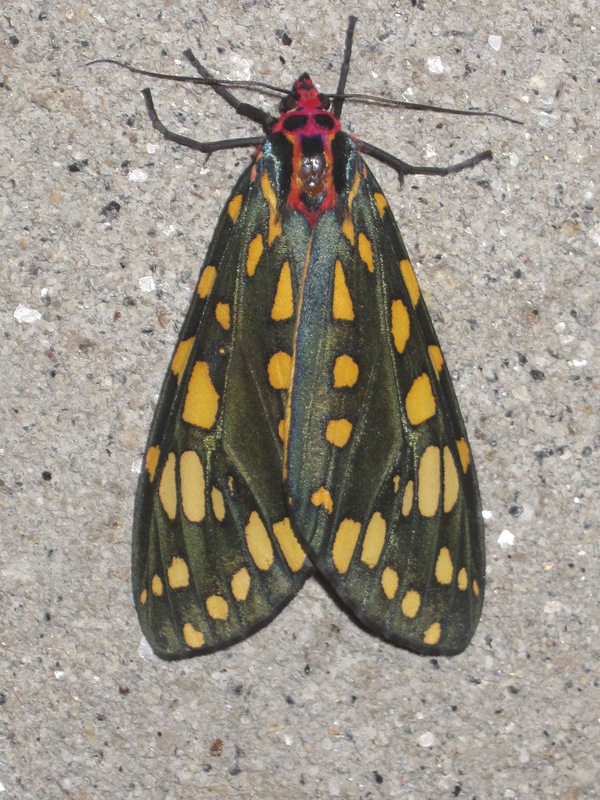 OK, Bhutan’s done it, why can’t the rest of us? A day without vehicles! Throughout this little Kingdom, the government has legislated that one day per week, Tuesday, every town will keep cars out of the main traffic areas from 8:00 AM to 6:00 PM. 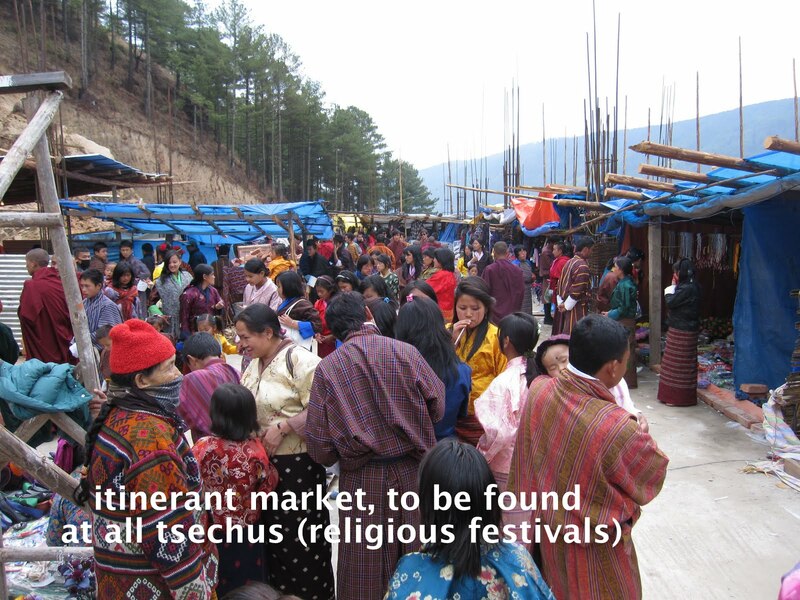 The only exceptions are taxis, delivery vehicles, and a few government cars with a trip permit. My students are proud of this and sending letters to a Canadian environmentalist, sharing what Bhutan is doing to make a difference. A group of women sits on the curb selling their garden produce. They’ve chosen a place where the road widens and serves as a nexus for many travelers. We see them there every day but Tuesday (no car day) and Sunday, beneath the shade of a willow, their tarp spread out for piles of cauliflower, potato, cabbage, tomato, green beans, chilies, and plastic bottles of buttermilk. 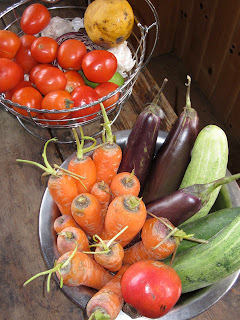 There are four of them, always with the same produce, and seem just as happy to help you buy from their neighbour’s pile as from their own. 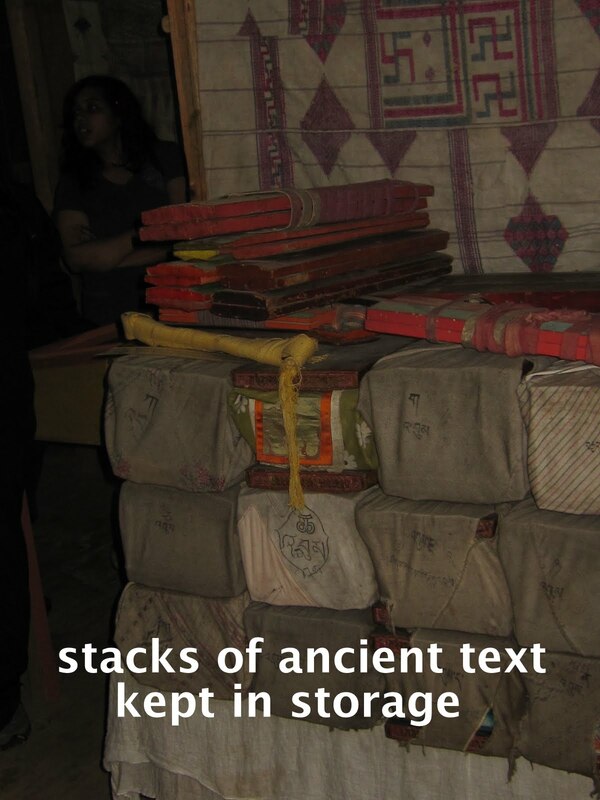 As in the shops, you buy by the half kg, and one of them keeps a collection of graded weights and a scale for measuring: a stick on bamboo with two tin plates, balanced from either end with three strings. They speak no English, but discuss our purchases with one another. Behind us the odd car negotiates the corner, slowing down for horses coming back from pasture, honking to remove cows that have become inert in the heat, or picking up children on their way home in the monsoon downpour. Often, drivers park in the middle of the road, lean across the open passenger’s door, and negotiate materials for dinner. You’ve heard it before, this is bovine country. 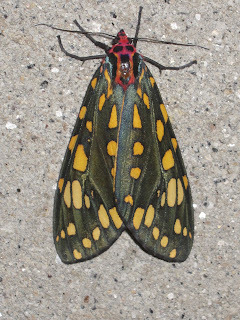 They are all over the roads during the day, and many sleep on them at night. Going to school, we veer away from fresh cow patties, and the rest of the journey is spent judiciously avoiding the smeared ones. Walkers at night, beware. If you don’t sink into a fresh dump planted in your way, you might bump into its donor, lying--or standing--asleep in the middle of your lane. The cows come and go at milking time, leading their calves in a long line that alternates sides of the road, depending on who’s honking, how much, and from which direction. The bulls are on holiday, and do little more than blink dumbly when you pass. Sometimes two will push one another around a bit, rubbing heads playfully. But they seem to lack the energy for real aggression. Tara bought a set of Khuru darts for our anniversary... it's OK, probably doesn't mean anything…. But yesterday it proved more difficult than it looks. I had a hard time getting a good straight lateral spin on it, let alone reaching the full 25 metres to the target. A twelve year old showed us what is possible if we practise: nice and straight, 15 cm from the target after 3 throws, which nets 1 point. Next weekend’s a staff tournament, so I know what I’m doing after school this week. Like archery, there’s a whole singing/dancing protocol to be met if you reach the target for the full 3 points. The drinking that goes on apparently helps, and these are full-day events, continuing in the dusk. The school Khuru pit, with 25 metres between targets. A bullseye means your team sings and dances a traditional victory display, same as with archery. 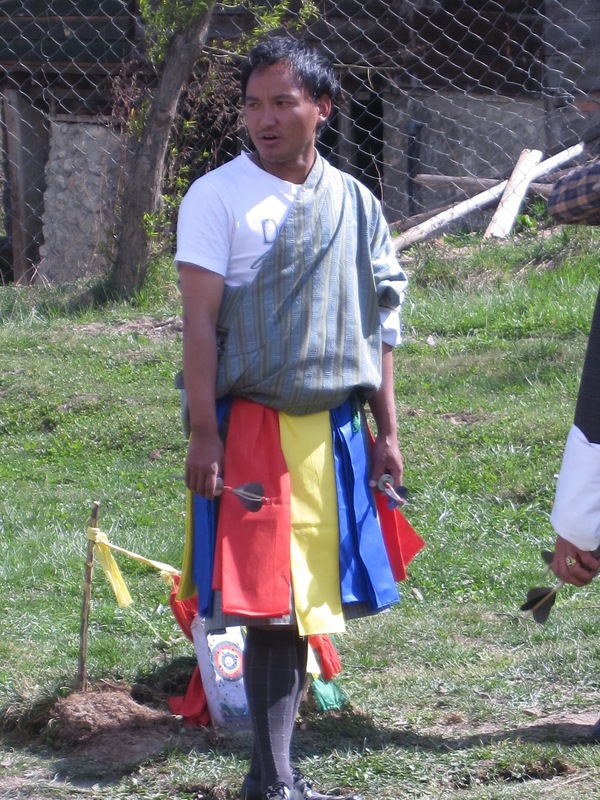 This means soccer in Bhutan, and locals are all pretty passionate about it. The buses that ply the Lateral Road are festooned with FC stickers, usually Manchester United or Chelsea. You’ll find these emblems on shop windows, car bumpers, schoolbooks, restaurant walls, hotel desks…. Playing the game is easy, and any spherical object will do. I’ve seen many shapes and sizes of balls, often barely inflated. Children will even roll up old clothes in a ball and kick that through the dust, as well. The possibilities for girls are growing, too. 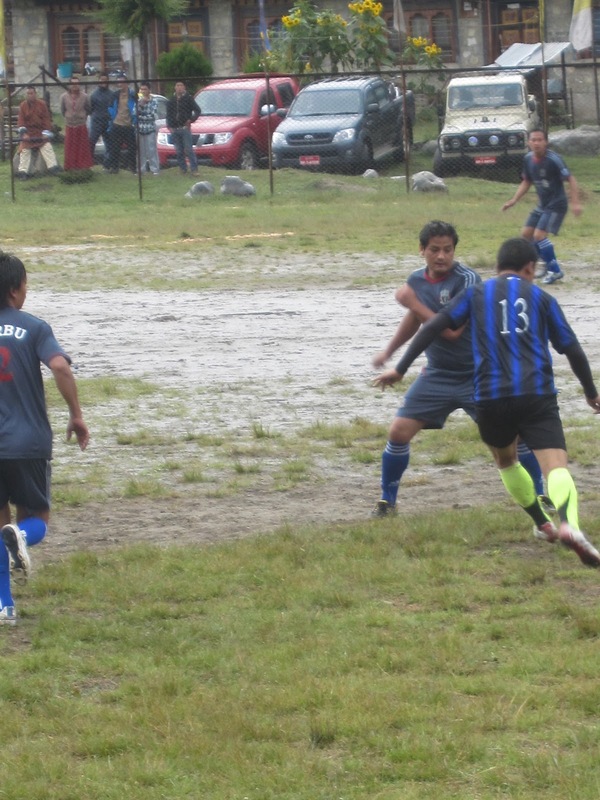 In February, two girls from my class were away playing football for the Bhutan National Junior team in an Asian tournament. But the fields are rough, sometimes in terrible condition. The surfaces are so uneven that many players never seem to develop the strategy of simple, direct passes. The game is ‘kick and run’, won through sheer athleticism rather than strategy, with both teams fighting for contact with the ball and field position rather than for ball possession. Often their one-touch is good, wacking the ball in mid air to send it forward. Back-passes are rare, it’s all one-dimensional. I usually play defense, and I'm still baffled by their positioning. My Wangduecchoeling Team is made up of a combination of Middle School and High School students and Middle School teachers. We’ve been in a couple tournaments this year, and just last night lost the semi-final match in the Chhumi tourney. Now that field has the worst playing conditions I’ve ever seen, even in National Geographic. Although the field is surrounded by a drainage channel, there is so much clay that a quarter of it is swamp! Playing right D, I had to scoop the ball up with my foot to release it from its hydrostatic state, then kick it in mid-air. 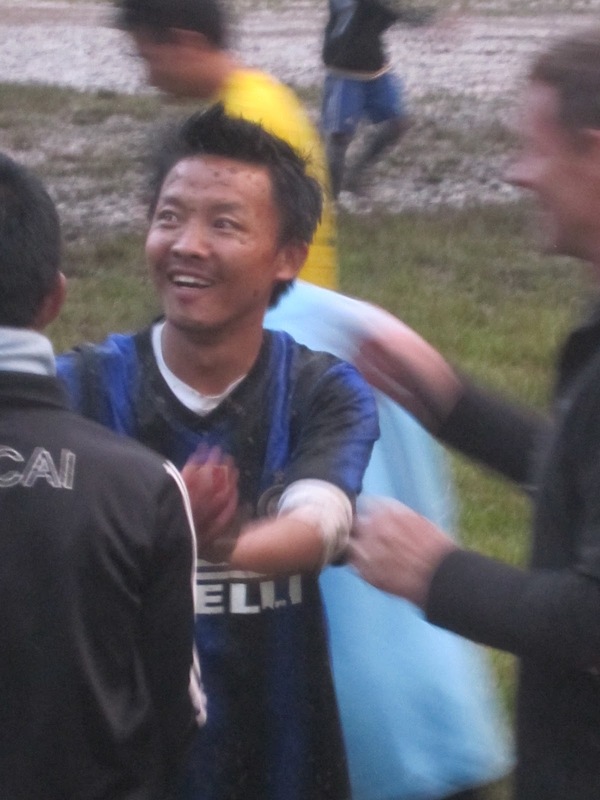 It's a whole new dimension to the sport, so I'll take back my comment about Bhutanese only playing in one direction. 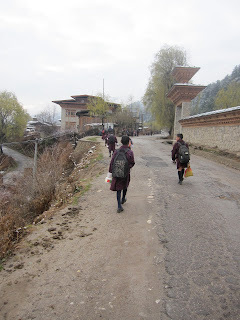 I suppose because of the weather, Bhutan’s school holidays run the opposite from us in Canada. Their big break is in the winter, when tends to be sunny and dry. 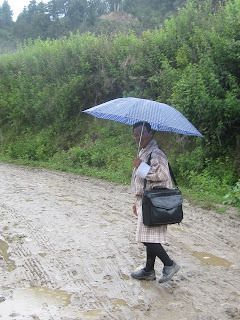 Summer holidays coincide with the monsoon, when mud prevails on the roads, landslides are common, and you never know when the sky might open up to a torrential downpour. So during our 2 week Summer break, BCF arranged for all the teachers to congregate in Bumthang at the River Lodge Hotel for 3 days of activities, wonderful food, and sharing of experiences from our first Term. It took some several days for some to arrive because of landslides blocking the roads. And before and since the retreat, we’ve been hosting many of the teachers at our house. 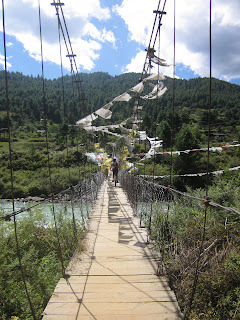 This week six of us took off to do the Bumthang Cultural trek, a 3-day hike to the next valley. 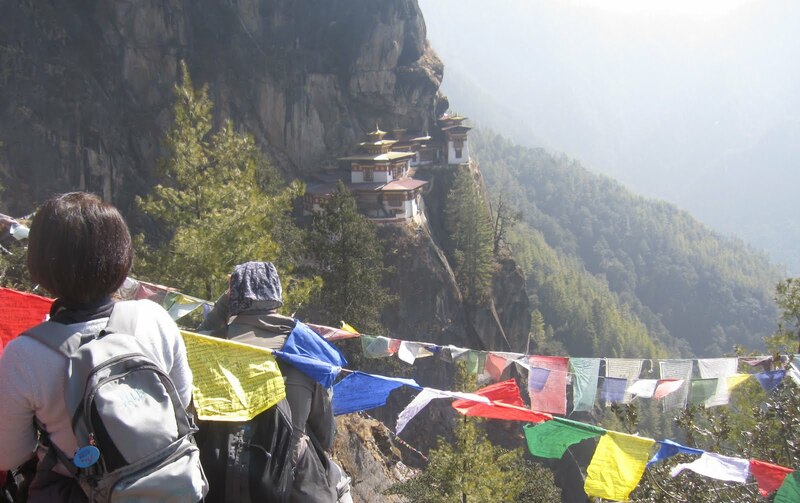 The weather was perfect, our guide Tshering knew the trail well, and we were all taken away by the natural beauty of this area. First night was at Gnang Lhakhang, a 15th century temple and adjoining farmhouse. thick stone walls pt together with mud and massive pine framing. Dark inside, the pine floors are made from 50cm wide boards. Instead of windows, they traditionally have sliding wooden panels, retrofitted with glass windows. People usually live on the second storey, accessed up a ladder. 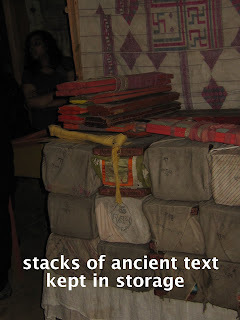 The first floor was for storing farm equipment and food, though the younger generation of the family sleeps there now. The attic is open air, used to dry grain and supplies. chilies in the other and butter churner on left. But this isn't a museum, it's how they cook! buckwheat noodles, straight from their field! 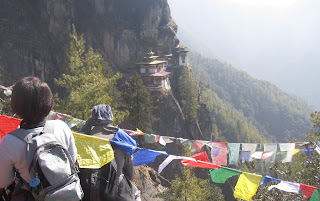 We started our second day climbing up a hill to a 16th century Dzong (=fortress) that had been destroyed in an explosion. The Desi (=feudal ruler) who built it was pretty mean to his peasants, demanding too many tax crops to be given to him, and charging too much for people to pass through the valley. So people complained, and a Tibetan king sent an army to attack. The Desi ran down to the foundations of the dzong, planted gunpowder with incense, and ran away to the next valley. When the army entered to search for him, the incense burned down and ignited the gunpowder, killing the Tibetan army in the explosion. 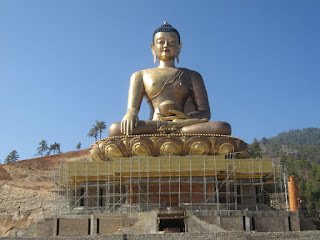 Last year the Prime Minister, who has a house nearby, organized an archeology team to start rebuilding the Dzong. We wandered around the ruins for an hour, wondering if we would see artifacts and weaponry. But it was so overgrown, we focussed instead on the amazing views of the valleys and clouds below us.